I like to look up to see if there’s anything interesting to see above me, I think it’s a habit I have because of the fact that I’m super short, like 151cm short. So on holiday, I always end up taking photographs of things up above me. After all, you can imagine how disadvantaged I am to try and take a high angle shot of ANYTHING. Well, accept for things at ground level like bugs and ground animals and babies. Anyway, I digress, my point is, Travel With Intent’s current challenge is right up my alley. But first, I have to say a big thank you to Cee Neuner for leading me to this challenge. 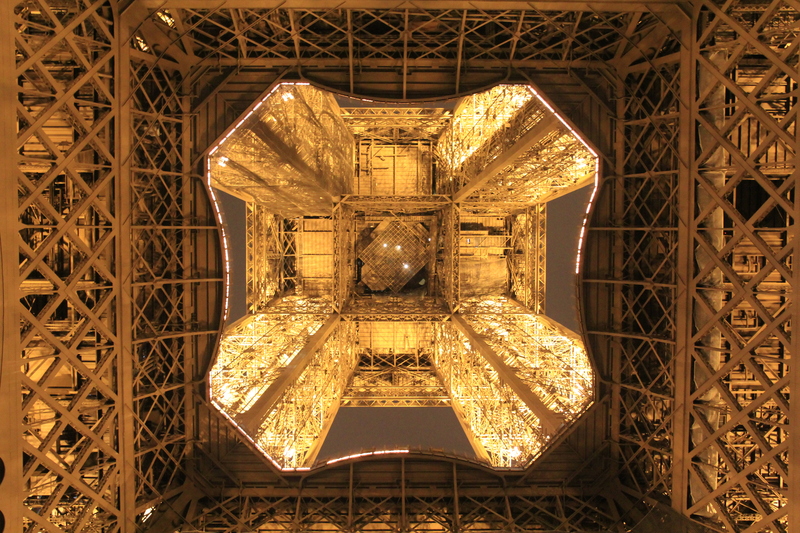 Looking up at the Eiffel Tower from a unique point of view – right under it. Maybe you think I’m strange, but this is actually one of my favourite photographs of the Eiffel Tower. I remember walking like an idiot, looking up instead of ahead, trying to position myself right under the very centre of the tower. I think I’m off by quite a bit, but it’s still a gorgeous view nonetheless. I hear you asking this: Now why would you take such a shot of the Eiffel Tower? Most tourists take photographs of the entire monument! The Eiffel Tower is one of the most famous icons in the world and everyone who has visited the City of Love has either taken a photograph of the monument or with it. Named after engineer Gustave Eiffel, it was quite the engineering marvel at the time. But at it’s core, the beauty of this engineering feat was how this huge monument was put together. Each complex component was painstakingly assembled, part by part, before being sent to the location to be joined together to form what we see now – the Eiffel Tower. That is what amazes me. To know it’s history, to stand right under it, and to imagine what it was like to create such a structure in 1887. Remembering all this makes me appreciate each rivet and beam that forms the Eiffel Tower. The beauty is in its details. And that is why I love this photograph of the Eiffel Tower, the tallest structure in Paris. Still think me unusual? Why thank you. I have learnt to revel in being sufficiently different. The french are divided when it comes to how they feel about the Eiffel Tower. Some think it sticks out like a sore thumb and is too modern for their liking, while others learnt to embrace what has become a Parisian Icon. Does your country also have a world famous structure you aren’t too hot about? What other icons of the world have you visited or wish to visit?